The MV Smiling Seahorse liveaboard was built in Ranong, Thailand, new for the 2018-19 high season. The steel construction vessel takes a maximum of 16 guests on board. She is 25 meters in length with a six meter beam. She has four decks, two of which will be cabin decks. Smiling Seahorse liveaboard’s comfortable dining area features a bar and and sofa seating area. Her large photography room is perfect for underwater camera care. Smiling Seahorse liveaboard has eight guest cabins, two master and four deluxe on the main deck, both with en suite baths. 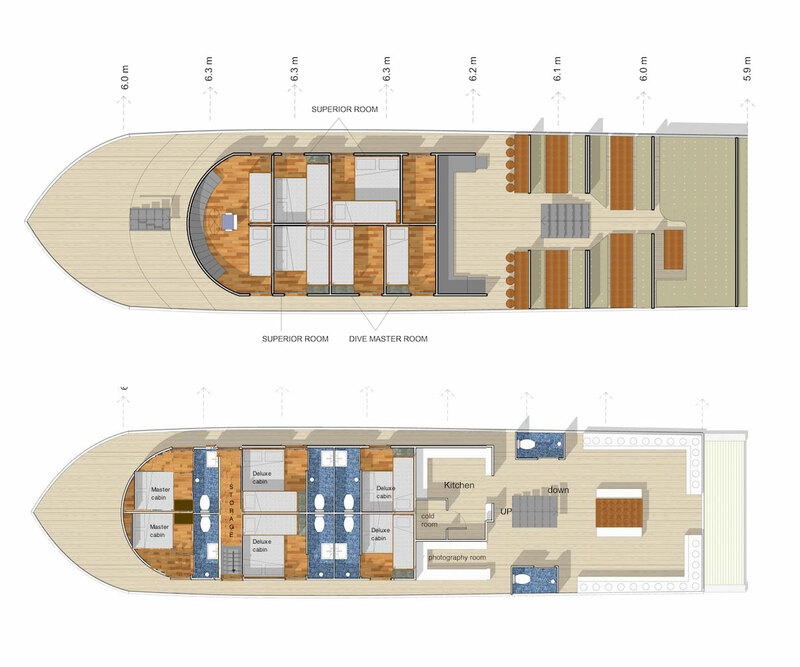 She will have two standard cabins with a shared bathroom on the upper deck. All Smiling Seahorse liveaboard cabins are air conditioned. The Smiling Seahorse liveaboard operates both in Thailand and Myanmar. Similan, Koh Bon, Koh Tachai and Richelieu Rock trips are four-days and three-nights and Mergui Archipelago trips are eight-days and seven-nights, or six-days and five-nights. She is available for individual bookings as well as charter cruises. Individual prices are listed below in the schedules, please contact us for full-boat charter prices. The Smiling Seahorse departs from Ranong, Thailand near the Burmese border. There are daily flights on Nok Air to Ranong from Bangkok. You may reach Ranong from Phuket, Khao Lak, Chumphon or Surat Thani by bus or minivan. Please note: Approximately 17 dives. Burma Fee $200 USD in cash. Itineraries are for general information only. We make no claims to being 100% accurate as there are too many factors affecting the schedule. We will give you the best diving on the best spots we can each day. Please note: Approximately 25 dives. Burma Fee $250 USD in cash. Itineraries are for general information only. We make no claims to being 100% accurate as there are too many factors affecting the schedule. We will give you the best diving on the best spots we can each day. Please note: Approximately 25 dives. Burma Fee $280 USD in cash. Itineraries are for general information only. We make no claims to being 100% accurate as there are too many factors affecting the schedule. We will give you the best diving on the best spots we can each day.